Your relations with the customer can secure the success for your business! Online CRM solutions make it possible to easily establish new relations and achieve your goals. There are lots of CRMs now: starting from traditional desktop solutions and to state-of-the-art Web-based apps, also known as online CRM or SaaS CRM. So, before you invest in the software, you’d better study the market, collect all the information and define the targets you want to achieve. Our articles provide you with the information you need to know about customer relation management and help you to choose the exact product which meets your requirements. Outdated client-server CRMs required investments in IT infrastructure, in particular, in networks and servers. Furthermore, a big issue was to involve an IT team to customize, set-up, deploy, integrate and maintain the system. As for web CRMs, you don’t have to buy them, just rent and use – so executives now don’t have to bother their heads with buying different software but spend more time on developing the business strategy and more important things. Web CRMs are much more affordable from the cost perspective. ✔ Short payback period. Our online CRM does not require any big investments. Instead, it will save your money and secure the budget for other needs. See the pricing here. ✔ Success. Online CRM solutions are much easier to use and they feature flexible tools for managing sales plans and client databases. Web CRMs open new horizons for your business! ✔ Quick customization. Web CRMs use very simple settings and user-friendly interface. Even first-time users can fine-tune it according to their specific needs. But if you want more complicated setting and calculations (with programming, for example) our specialists are always happy to help you. ✔ Unlimited opportunities. This online database software solution can easily be tailored according to your needs due to its flexibility. See the list of features here. ✔ High reliability. All servers are located in safe data centers. All information in your online databases is daily backed-up. ✔ Quick updates. Updates for online CRMs are almost instantly downloaded and installed so that you always used the latest version of the program. 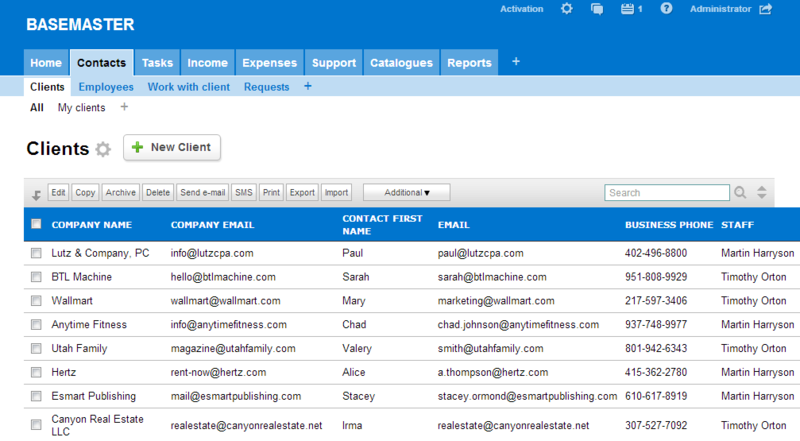 You can see the example of Contacts category in Basemaster account below. Forever free trial. Sign up in 60 seconds.